Seeking to enhance the returns on your organisation’s investment for its displays at the upcoming trade shows? Scribo Displays offer you attractive and cost-effective wall-mounted displays for your stall/booth at the trade show. 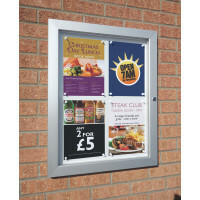 Our slim noticeboards come with aluminum frames and tamper-proof glazing panels. The slim noticeboards also come with magnetic pins to attach display material in the landscape and/or portrait styles, according to the user’s convenience. The doors of these slim noticeboards stay fitted to the frames and we also provide a set of keys for you to lock the panel. Go through our catalogue of attractive and cost-effective slim noticeboards to locate the wall-mounted displays that best suit your needs.